. (1395). تنش و تضاد قانون‌گرایی و فرهنگ در عصر جهانی‌شدن. پژوهش های روابط بین الملل, 6(21), 135-158.
. "تنش و تضاد قانون‌گرایی و فرهنگ در عصر جهانی‌شدن". پژوهش های روابط بین الملل, 6, 21, 1395, 135-158.
. (1395). 'تنش و تضاد قانون‌گرایی و فرهنگ در عصر جهانی‌شدن', پژوهش های روابط بین الملل, 6(21), pp. 135-158.
. تنش و تضاد قانون‌گرایی و فرهنگ در عصر جهانی‌شدن. پژوهش های روابط بین الملل, 1395; 6(21): 135-158. آشوری، داریوش. (1384). تعریف­ها و مفهوم فرهنگ. تهران: نشر آگه. بایبوردی، اسماعیل و علیرضا کریمیان. (1393). «جهانی‌شدن فرهنگ و تأثیر آن بر هویت ملی ایران». فصلنامه مطالعات روابط بین­الملل، 7 (28). صص 102 – 77. بیکس، برایان. (1389). فرهنگ نظریه حقوقی. ترجمه محمد راسخ. تهران: نشر نی. بهشتی، سید علی رضا. ( 1379). «فرهنگ و هویت ایرانی؛ فرصت­ها و چالش­ها»، فصلنامه مطالعات ملی، 1 (4). صص 60 – 11. تاجیک، محمدرضا. ( 1379). 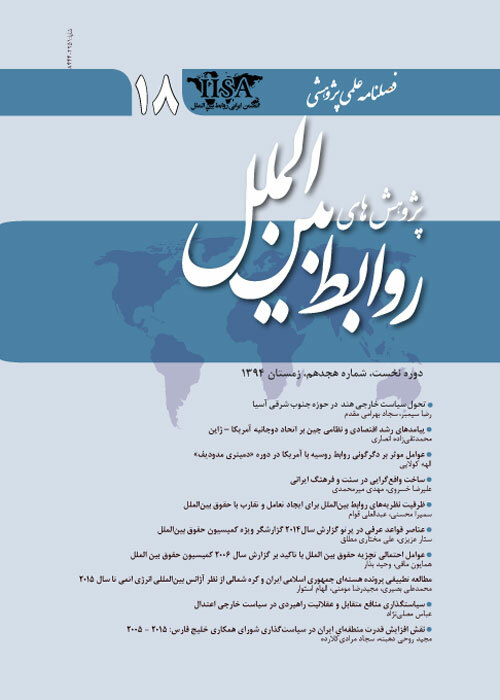 « فرهنگ و هویت ایرانی؛ فرصت­ها و چالش­ها»، فصلنامه مطالعات ملی، 1 (4). صص 60 – 11. حاجیانی، ابراهیم. (1379). «تحلیل جامعه­شناختی هویت ملی در ایران و طرح چند فرضیه»، فصلنامه مطالعات ملی، 2 (5). صص 228 – 193. چلبی، مسعود. (1382). جامعه­شناسی نظم. تهران: نشر نی. چاپ دوم. رحمت­الهی، حسین. (1388). تحول قدرت. تهران: نشر میزان. روح­الامینی، محمود. (1379). «فرهنگ و هویت ایرانی؛ فرصت­ها و چالش­ها»، فصلنامه مطالعات ملی، 1 (4). صص 60 – 11. سراج‌زاده، سیدحسین و مینا بابایی. (1389). «جهانی‌شدن، فرهنگ جهانی و کج‌روی فرهنگی»، فصلنامه علوم اجتماعی، (48). صص 71 – 43. سلیمی، حسین. (1384). نظریه­های گوناگون درباره جهانی‌شدن. تهران: نشر سمت. سیمبر، رضا. (1378). «سازمان‌های غیردولتی و نفوذ آنها در جامعۀ جهانی»، مجله اطلاعات سیاسی - اقتصادی، (148-147). صص 177 – 166. .............. . (1378). «تروریسم در روابط بین­الملل؛ چالش­ها و امیدها»، فصلنامه راهبرد، (21). صص 82 – 68. شهرام­نیا، امیرمسعود. (1385). جهانی‌شدن و دموکراسی در ایران. تهران: انتشارات نگاه معاصر. صانعی، پرویز. (1381). حقوق و اجتماع. تهران: انتشارات طرح نو. فرهادی‌محلی، علی. (1390). «بررسی تحلیل پدیدۀ جهانی‌شدن با تمرکز بر فرهنگ»، فصلنامه مطالعات راهبردی سیاست­گذاری عمومی، 2 (5). صص 96 – 63. گل­محمدی، احمد. (1383). جهانی‌شدن فرهنگ، هویت. تهران: نشر نی. چاپ دوم. مورن، ادگار. (1394). انسانیت انسان. ترجمۀ امیر نیک­پی و فائزه محمدی. تهران: انتشارات قصیده­سرا. چاپ چهارم. نظری، علی‌اشرف. (1390). مدرنیته و هویت سیاسی در ایران. تهران: نشر میزان. نیاکویی، سیدامیر. (1387). «توسعه جنوب در پرتوی اقتصاد جهانی؛ کارآمدی دولت و جهانی عادلانه­تر»، فصلنامه راهبرد توسعه، (16). صص 141 – 120. نیاکویی، سیدامیر و حسین بهمنش. (1391). «بازیگران معارض در بحران سوریه: اهداف و رویکردها»، فصلنامه روابط خارجی، 4 (4). صص 135 – 97. هیوود، اندرو. (1392). سیاست. ترجمۀ عبدالرحمن عالم. تهران: نشر نی. چاپ سوم. Banakar. R and Sh. NasrolahiFard. (2012). Driving Dangerously: Law, Culture and Driving Habits in Iran. British Journal of Middle Eastern Studies, 39 (2), pp. 241 – 257. Hartmann, M. E and A. Klonowiecka – Milart. (2011). Lost in Translation Legal Transplants Without Consensus-Based Adaptation, in The Rule of Law in Afghanistan: Missing in inaction. Whith Mason. Cambridge. Hyden, H. (2011). Looking at the World through the Lenses of Norms, in Understanding Law in Society: Development in Socio-legal Studies, Papendorf K, S. Muchura and K. Andenæs. Germany Lit Verlag Münster: 120-154. Clark. I. (1999). Globalization and International Theory. Oxford. Jackson, J and (etc). 2014. Corruption and police legitimacy in Lahore. Pakistan. Available at: Http://ssrn.com/abstract=2421036. Katouzian, H. (2009). The Persians: Ancient, Mediaeval and Modern Iran. New Haven: Yale University. Krasner, S. D. (1999). Sovereignty: Organized Hypocrisy. Princeton University Press. Krygier, M. (2007). The Rule of Law: Legality, Teleology, Sociology. University of New South Wales Faculty of Law Research Series. …………… . (2016). The Rule of Law: Pasts, Presents, and a possible Future. Paper for seminar co-sponsored by Center for Study of Law & Society and Kadish Center for Morality, Law & Public Affairs. University of California Berkeley. Licht, A. N, et al. (2007). Culture rules: The foundations of the rule of law and other norms of governance. Journal of Comparative Economice, 35 (4). Licht, A. N. (2008). Social Norms and the Law: Why Peoples Obey the Law. Electronic copy. Available at: Http://ssrn.com/abstract=1319242. Linklater, A. (2007). Citizenship, Humanity, and Cosmopolitan Harm Conventions, in Critical Theory and World Politics, Routledge. Marshall, D. (2014). The International Rule of Law Movement. Human Rights Program. Harvard Law School. Mehmetaj, J. (2014). The Impact of the Political Culture Im Political System And Rule Of Law: Albania Case. European Scientific Journal, 1. Robbins, S. P. (1996). Organizational Behavior: Concepts, Controversies, Applications. Prentice Hall. Rosen, L. (2006). Law as Culture: An Invitation. Princeton University Press. Sellers, M. (2010). An introduction to the rule of law in comporative perspective, in The Rrule of Law in comparative perspective, sellers. M and Tadeusz tomaszewski. Springer. Tadjbakhsh, Sh and H. Mahbubai. (1387). Human Security Vision and Unfelted Derm? Strategic Quarterly. Tamanaha, B. Z. (2004). On The rule of law. Cambridge. Tyler, T. R. (1990). Why people obey the law. Princeton university press. Tyler, T. R and J. M. Darley. (2000). Building a law – abiding society: taking public views about morality and the legitimacy of legal authority into account when formulationg substantive law. Hofstrat law Review, 28. Tyler, T. R (2001). Trust and law – abidingness: a proactive model of social regulation. The Australian national university. research school of social science, (16). Turner, B. S and A. Possamai. (2015). Introduction: Legal Pluralism and shari´a, in The Sociology of Shari’a: Case Studies from around the World. Possamai. A, J. T. Richardson and B. S. Turner, Springer.